Cité des Arts welcomes the Mardi Gras Art Show from Lafayette artist Lyn Fontenot. 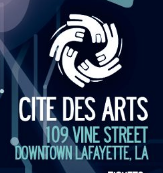 Having recently exhibited her “Northern Lights” work at Cité des Arts, Dr. Fontenot returns to the gallery with an opening reception on Saturday, February 14th from 5:00 – 8:00 pm (in conjunction with Lafayette’s Artwalk). Dr. Fontenot paints a variety of subject matter: landscapes, seascapes, street scenes, animals, flowers, just to name a few. She has shown work in the United States and in France, and teaches art privately and at the University of Louisiana at Lafayette.